In 1980, the average worker on the bottom half of America’s income ladder earned about $16,000 a year (in today’s money). Over the ensuing three-and-a-half decades, the average national income in the United States grew by 61 percent. That rising tide lifted all boats so high that, by 2014, the average worker in the bottom 50 percent took home a whopping … $16,000 a year. Meanwhile, the average denizen of the top one percent went from earning an inflation-adjusted $428,000 in 1980, to taking home $1,304,800 in 2014. Which is to say: In the years since Ronald Reagan was first elected, the average income among the one percent went from being 27 times larger than that of the bottom 50 percent, to being 81 times larger. That ratio — 81 to 1 — happens to be equivalent to the ratio between the average income of the United States and that of the Democratic Republic of Congo. In other words, in terms of relative economic power, America’s top one percent is to its lower middle class, as the world’s wealthiest nation is to a war-torn, third-world nation where over 60 percent of people live in poverty. But it wasn’t just the richest of the rich who feasted on the growing economic pie, while the working class nibbled nervously at its shrinking slice. Although the Davos set did enjoy the lion’s share of the income gains since 1980 — the top 0.001 percent saw its earnings increased by an average of 636 percent — individuals in the top 10 percent still saw their paychecks swell by a not-so-shabby average of 121 percent. 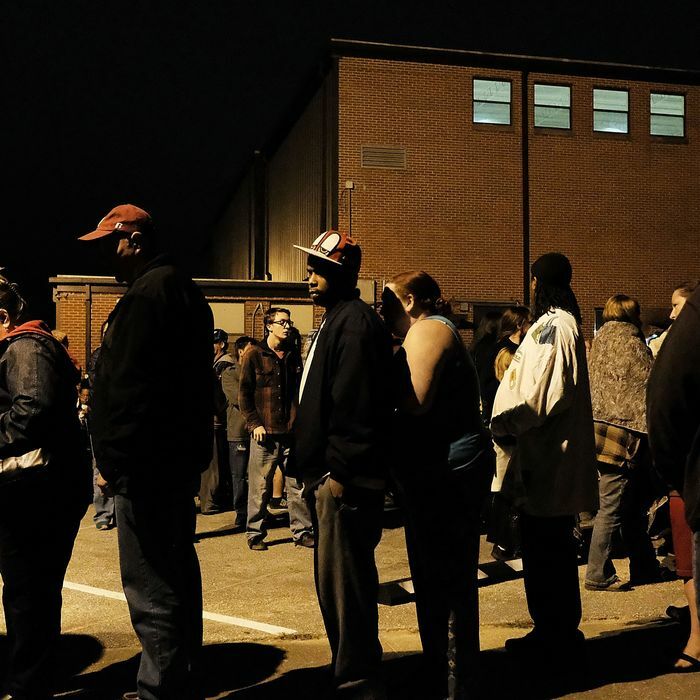 All these grim statistics come courtesy of a new study conducted by three of the world’s foremost chroniclers of economic inequality — Thomas Piketty, Emmanuel Saez, and Gabriel Zucman. Their research not only provides an exceptionally granular portrait of America’s yawning income gap, but also rebuts two popular arguments against the need to narrow that gap through public policy. 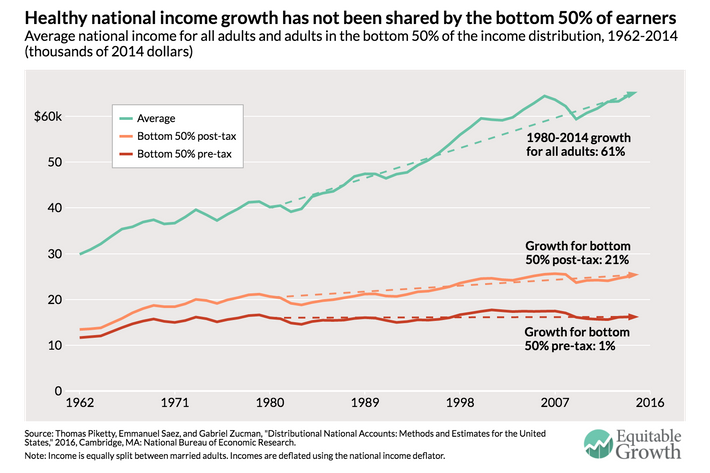 One of those arguments is that the size of the income gap has been routinely overstated, since much of the research on inequality has ignored the ameliorating effects of taxes and transfers. Which is to say, a lot of studies have measured inequality in terms market income — how much an individual earns, without subtracting what gets lost through taxes and gained through the value of government programs and benefits. Since the wealthy tend to pay a higher share of their income in taxes — and the less affluent enjoy a disproportionate share of social spending — surely, the real income gap is substantially smaller than most studies make it out to be. But America isn’t nearly as comfortable with redistributing wealth as most other Western democracies — and we’re particularly averse to social spending targeted at the neediest among us. While the portion of national income that gets transferred via taxes has grown since 1980 — at present, one-third of all income gets collected by Uncle Sam — the bulk of these transfers are targeted at the elderly or the middle class (defined as individuals who earn above the median but below the 90th percentile). The combined effect of middle-class welfare — the home-mortgage interest deduction, the tax exclusion on many workplace benefits, and other tax credits — allowed the average income of such households to rise 10 percent between 1999 and 2014. 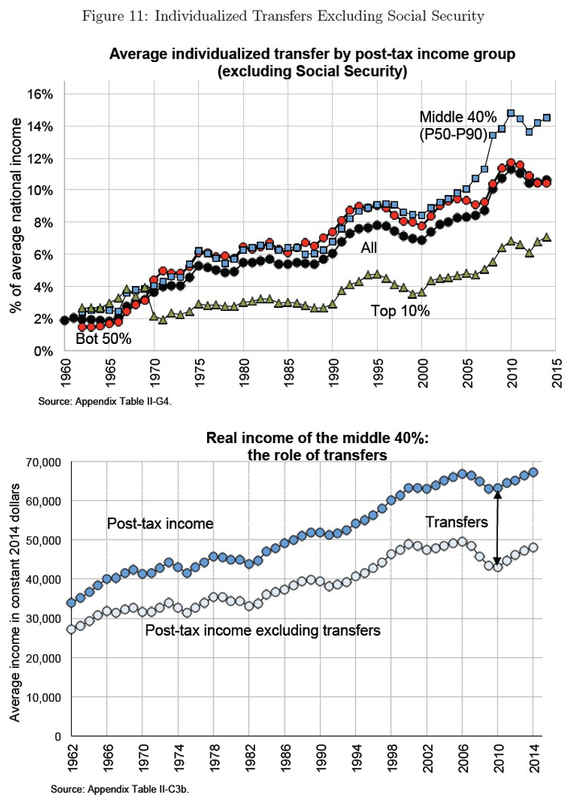 Without such transfers, middle-class income would have stagnated over that period. Thus, Picketty and company did find that the gap between the middle and the top of America’s income ladder is slightly narrower than previous studies have suggested. But because market incomes on the bottom of half of the ladder actually fell between the peak of the Clinton boom and 2014 — and because the working class and poor receive less in (non–Social Security) transfer payments than the middle class does — the bottom 50 percent of workers saw no income growth over those years. 1. A disproportionate share of those gains went to the elderly. 2. The gains that did go to working-age adults came exclusively in the form of higher-value government benefits. In terms of actual, disposable cash income, the average worker in the bottom 50 percent is no better off after taxes and transfers: They still end up making roughly $16,000 a year. So: Inequality remains massive, even when you consider all the “free stuff” the government gives to poor people. But not all arguments against making inequality a central concern of public policy deny the problem’s severity. Some, merely insist on its inevitability: America’s massive income gap is the product of the intractable forces of globalization and automation. It’s a winner-take-all economy where average workers simply aren’t worth what they used to be; and trying to change that reality would require such heavy-handed redistribution, you’d just end up sapping growth and leaving the working class with a slightly larger slice of a much smaller pie. But via cross-country comparisons, Gabriel Zucman dispatches this objection quite easily. Critically, what you’re looking at here is not the generosity of the French welfare state. That’s a graph of market income. Somehow, globalization has not prevented “low-skill” French workers from enjoying income gains in the workplace. 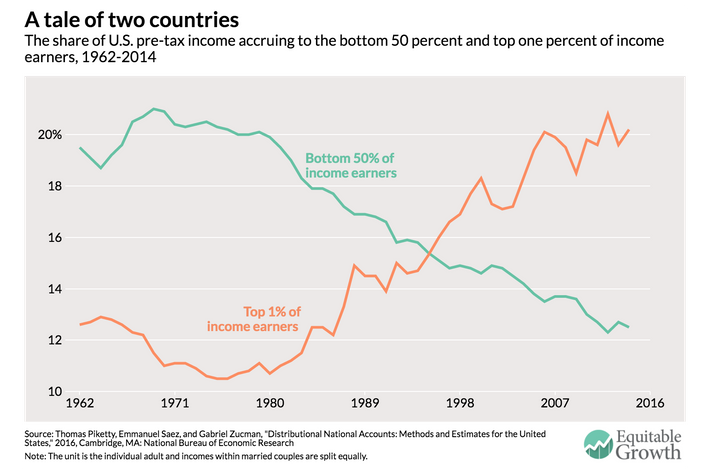 For progressives in the United States, one lesson of these findings is that tackling inequality requires far more than raising taxes and increasing welfare (though both are necessary). Liberals must also push for reforms that equalize the allocation of income before taxes come into play. Such reforms might include boosting workers’ bargaining power through strengthened unions and downsizing the finance industry, so as to redistribute all the wasteful economic rents that Wall Street absorbs. In other words, we need to do the opposite of what our next president has planned.